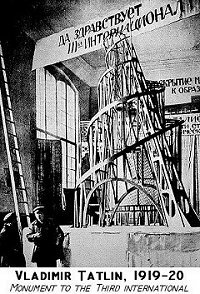 Constructivism was an influential Soviet (Russian) art movement of the 1910's-20's. It included the first nonrepresentational constructions and introduction of kinetic elements (components that moved or changed over time). 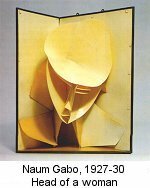 Constructivists applied a 3D Cubist vision to sculpture, influenced by such works as Picasso's reliefs of 1912-13. In particular, they experimented with building up a sculpture from nothing by adding elements (such as paper, metal etc) rather than traditional sculptures which were created by taking away material from a solid block (of stone, wood etc). 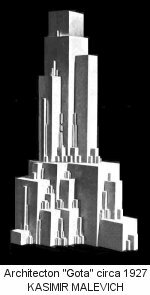 Many of the principles of Constructivism were more widely adopted by other Moderist streams in other countries. 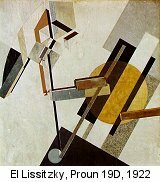 For the purposes of this module, assume the terms "Cubo-Futurism" and "Suprematism" are forms of Russian Constructivism. 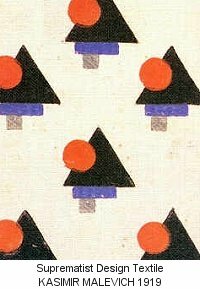 No doubt the groups and individuals at the time found their differences more significant than their similarities, but in terms of their impact on art & design and the part they had to play in the development of Modernism, I think it's fair to consider the following as one group - the Russian Constructivists. modern materials such as plastic and electroplated metal. Co-creator of the Realistic Manifesto, sculptor and painter. 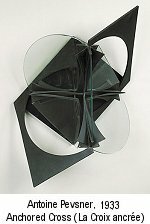 Did works in new materials such as Perspex and other plastics. Brother of Naum, worked in metals and plastics. TECTONIC - the whole idea, the fundamental conception of the work based on social use and expedient materials. FACTURA - the realisation of the natural propensities (properties) of the materials themselves. 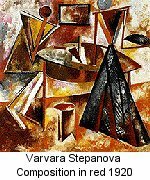 Constructivist painter and photographer. One of the earliest to experiment with photomontage. Leader of the Russian avant-garde, but also considered by some to be a prime propagandist of the Stalinist regime. Married to Rodchenko, collaborated with him in experimental photography. Painter, Collagist, Costume Designer. 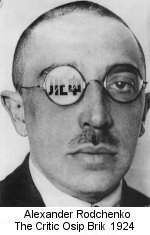 Perhaps ironically, one of the leading figures of the Constructivist movement worked in a very independant way, and therefore doesn't really fit comfortably into either of the abovementioned streams. In fact, he called what he did Suprematism, not Constructivism. 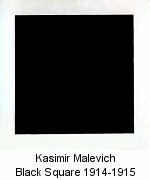 Kasimir Malevich (1878-1935) also called Kazimir Malevich. Most remembered for his famous ground-breaking Modernist paintings such as the much copied "White on White" and "Black Square". Over his very long career, his painting style varied a great deal. Typographer, book designer and architect. 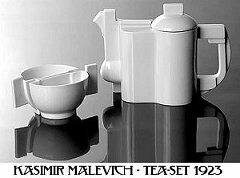 Theorist on Modernism, and often collaborated on projects with Malevich. WWI had a huge impact in Europe. So many soldiers died that there was hardly a family in Europe who had not lost someone. This was the machine age - but those machines had caused much devastation in the war. The confidence of the old empires was dented, nostalgia was replaced with a desire for a new, different future. Russian Revolution and the rise of the Communist State. New materials and processes were developed - plastics, metal alloys, plywood. Modernism is also used as a Fine Art term, including all of the above.